NASA’s revealed plans for manned human spaceflight, centering on the four-seat, conical Orion capsule. NASA’s plans for manned human spaceflight are salvaged from the wreckage of the Constellation program. Seems the future is borrowed from the past: It’s all about the Orion capsule, and the support spacecraft it’ll be bolted to. In this metal and plastic cone, we may end up going to Mars. 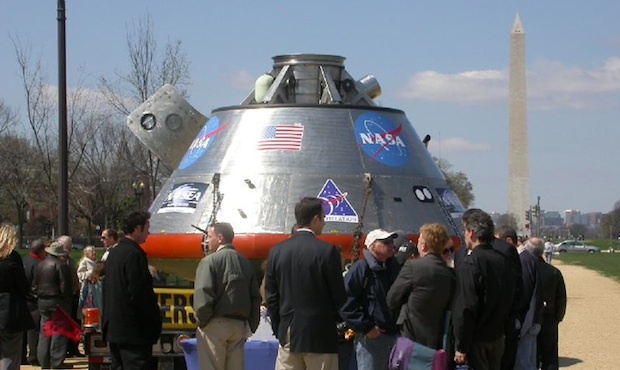 Orion is a 16-foot wide, 11-foot high, 20,000-pound cone of metal, alloys and composites. Inside, there’s space for four astronauts and limited cargo among much flight control and life support equipment. On its side, a hatch to allow ground access and at its tip a moveable circular hatch and docking attachment by which it can mate with spacecraft, and through which crew can move. At its rear is a glass-filled epoxy heatshield, made from an Avcoat material derived from coal and designed to be discarded after each use as the Orion itself is refitted and repaired before being sent aloft again. Originally planned to be part of the Constellation program, a grand billion-dollar scale project to take humans to the Moon and beyond, Orion was one of the few bits of the program to survive its cancellation. Now, thanks to plans just unveiled by NASA administrator Charles Bolden, Orion will be the core of a new spacecraft called the Multiple Purpose Crew Vehicle and will be key to getting humans beyond low Earth orbit and out into space. Apollo’s Command Module: A metal and composite cone 11-feet high, 12-feet across and designed to carry three men into space and back to Earth. At its rear an epoxy heatshield made from Avcoat, on its side a hatch for ground access and a docking attachment/ crew tunnel system at its tip. Spot the similarities? We’re all aware the Shuttle is about to take her last flight and Atlantis is being geared up ready to be rocketed into space even as you read this. We also know that key government decisions have stripped NASA’s plans and funds to get men into space, to the point we’ve been unclear about how we’ll get astronauts aloft for the next five years, apart from potential private space company developments and paying for rides in Russian Soyuz machines. Late yesterday, NASA chief Charles Bolden tried to straighten out some of this by confirming how NASA will take men into space in the future using Orion. The plan seems to call for us to essentially timewarp ourselves back to the mid 1970s, when the Apollo program was cancelled, so NASA could concentrate its efforts on the Space Shuttle (how familiar that political move sounds!). Why would we want to do this though? In a word: reliability. That’s something the Space Shuttle couldn’t supply in its final configuration–no matter how successful you think the amazing program has been, technical hitches arose all the time and the Challenger and Columbia disasters were a painful reminder of the complexity of the system. If successive governments hadn’t stripped the Shuttle program of development cash, it would probably have flown into space using a different method and we’d not have seen so many technical woes or disasters–and thus the future of U.S. manned space flight would probably rest on Shuttle-derived tech. But it didn’t. Meanwhile Apollo was an astonishing success, and its technology proved resilient. The Saturn V rocket that powered it into space is still the biggest ever flown (check the video at the end of the post to remind you just how astonishing it was). The idea was simplicity: The crew Command Module was sent into space with a one-use Service Module that contained support equipment and powerful rocketry that took the entire assembly to the Moon, and essentially this is the model for the new Multi Purpose Crew Vehicle. The J2-X engine which will fly the new system is even derived from the Apollo J2 second stage engine. Essentially Orion is trying to capture some of the simplicity and reliability of this model. Lockheed Martin, which also was involved with Apollo, is building the MPCV and notes that it’s up to ten times safer and more reliable for crew. And so, when humans fly into space on NASA rockets again, they’ll be strapped inside the Orion, leveraging new innovations based on old innovations, safer technology and a simpler tried-and-tested rocket design. We don’t yet know quite when it’ll happen–which is the last odd sticking point in NASA’s plans. But at least their ride is based on some solid history. Considering that today, May 25th, is 50 years to the day that President John F. Kennedy announced to a special meeting of Congress that inside a decade we’d land a man on the Moon, it’s a pretty historic moment.